Question: What could be better than starting off your day with a breakfast at the 21 Club? Answer: When that breakfast is part of the "Tastemakers" series hosted by Fashion Group International featuring a conversation between two living legend fashion designers: Norma Kamali and Anna Sui. Throw in yogurt parfait, and clearly, my morning couldn't get any better. 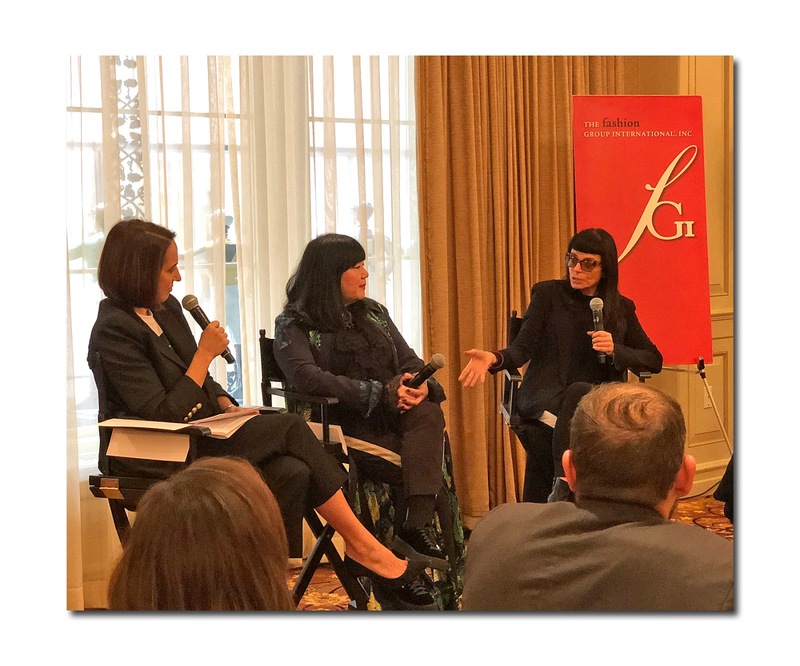 Both FGI President Margaret Hayes and moderator Anne Fulenwider, EIC of Marie Claire, introduced Kamali and Sui as "two fiercely independent women," while Fulenwider went on to point out that the two have "quite different aesthetics and visions yet are similar in history and heritage." After thanking sponsors Macy's and Interparfums, Fulenwider turned attention to Norma Kamali who she attributed with the kickoff of the activewear trend as well as "the development of a parachute coat that became the precursor to the puffer that we see everywhere." Of Sui, Fulenwider spoke of her rock & roll aesthetic and mentioned her recent solo show at the London Textile Museum -- the first ever for an American designer. It was a love fest between the two designers with Sui remarking that she had once moved to be near the Norma Kamali boutique. Fulenwider pointed out that both designers are daughters of immigrants -- Kamali of Lebanese and Basque descent, Sui of Chinese descent whose parents met while studying in Paris. Both were raised in families that expressed the importance of working hard and excelling in their chosen professions. Anne Fulenwider -- "How did you earn your first dollar?" Norma Kamali -- "It was working in my stepfather's candy store. I arranged all the candy bars by color and size. It was an obsessive kind of behavior. I also learned how to sell and how to make a New York City egg cream except that I was lactose intolerant so I couldn't drink them. I wanted to be a painter so I had to work to buy paint supplies and take classes. I went to FIT for fashion illustration because I thought that was a more certain way to make money than to be a fashion designer." She also told the story of her first job interview when the male interviewer had no interest in seeing her portfolio, only her rear view, and how that solidified her resolve to start her own company. Interestingly, I know she's been telling this story forever but it's now extremely timely with the subject of harassment arising everywhere. 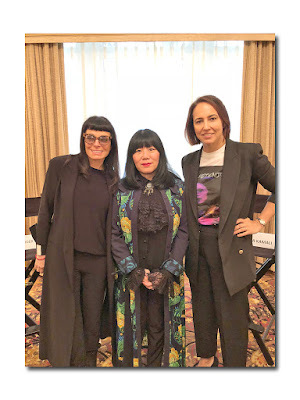 Anna Sui -- "I worked at a dry cleaner and I loved it because there were some women who had designer clothes from Courreges and I was obsessed. In 1981 I became a started my line by accident and it was in Macy's and Bloomingdale's since those were the fashion stores at the time. By the late '80s I was in Barney's. Steven Meisel was my friend who took me to Paris for fashion week. On our way to a show we stopped at the Ritz to pick up Madonna. She was wearing a coat but when we got to the show she told me she had a surprise for me. She took it off and underneath she was wearing an Anna Sui dress!" On their fashion breakthroughs Sui said: "It was the height of Chanel, Versace -- it was daunting to compete. The models like Linda and Naomi were generally in head to toe runway until suddenly it changed -- they were starting to imitate street style. I gave Linda a dress and when she went to Paris all the models wanted Anna Sui dresses." For Kamali the eureka moment came on a camping trip in the early '70s. "We used to go camping near The Narrows Bay, NY and canoe down the Delaware River. It was freezing and I had to use the bathroom so I unzipped and wrapped my sleeping bag around me and thought 'this is a great coat!'" She explained how she uses the NASA principle of cold and warm air exchange rather than down fill for warmth but remains true to the original pattern. What are some of the hurdles these designers have faced? Kamali told the story about Halston's assistant stealing her bathing suit design which ended up attributed to Halston on the cover of Time Magazine. Kamali was actually remarkably Zen after the initial upset. "Other people will profit from what you've done but I always had another idea and maybe they don't." She let him off the hook after he floated a parachute down on her head from the balcony of Halston's duplex apartment giving her the idea to use parachute fabric. Sui spoke about the pressures of doing a collection every season. "You have to come up with a concept, build the colors, fabrics etc. Then there's the challenge of the show and the reviews. We used to run to the newsstand early in the morning to buy all the papers to see what they thought. Now you get it more quickly on your phone." She also spoke of the challenges in building and keeping important industry relationships. "People change jobs and move around more," she added. AF--"What are the last three purchases on your credit card?" Without hesitation Sui admitted they were shoes and clothing. Surprising no one, Kamali listed hers as "wellness, wellness, wellness" adding that "healthy is beautiful" and "when you are 72 you have to exercise every day." AF--- "What gives you the greatest joy?" NK -- Making women feel beautiful and giving other people joy. AF -- "Do you have a secret talent?" AS-- Shopping! I know where to find anything. NK -- I have no secrets." NK-- Not knowing how to say 'no' to projects that there's no time for (to which her assistant in the audience nodded her head in the affirmative). AS -- Shopping! When I'm traveling I'm always looking for a half hour to find a flea market." NK -- Etta James, the blues. AS -- I'm the worst singer -- I don't do Karaoke. AF -- "What of the role of fame in fashion?" AS-- I'm very private. I don't talk about my friends and private life. NK-- I love being behind the scenes. I'd rather take your photo than you take mine. However I need to share my info with women -- it's my role now. AF -- "What's on your nightstand?" NK -- A playground ball so I can do exercises in bed while I answer emails. I'm not a TV person...'Schitt's Creek' was my last binge watch. AF -- "Any invention that you'd like to have?" NK -- A driverless car. I'm not afraid after some of the rides I've taken with New York City cab drivers. AS -- My nephew is a programmer and he's working on this app that coordinates dinner dates between you and your friends. After a brief discussion about how the fashion industry is broken and should shift to sell clothing in season thereby thwarting some of the knock-offs seen at H&M and Zara (at least according to Kamali), the designers were given the choice of answering either "I wish that..." or "In another life..."
AS -- In another life I would be a rock star who has no schedule to make an album or tour as opposed to a fashion designer with a rigid schedule. NK -- I wish that we could stop the objectification of women (and gay men). Objectification wears away at our self esteem and the secrets are devastating to our character and our worth. By sharing stories you cleanse and encourage others to do the same. Writers note: if you go on normakamali.com there are videos of various women in the spirit of #MeToo, doing just that.